Too Saucy: Um, what? A Lifetime movie with Will Ferrell and Kristen Wiig? Um, what? A Lifetime movie with Will Ferrell and Kristen Wiig? 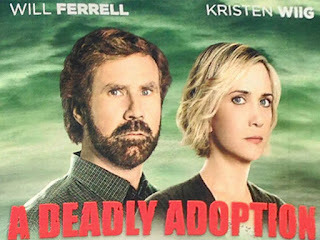 A mere month and a half after I confessed my guilty pleasure habit of watching cheesy Lifetime Movies, comes news that two of the biggest names in comedy, Will Ferrell and Kristen Wiig, are starring in what looks to be a prototypical and delicious Lifetime movie, A Deadly Adoption. I assume they have the same love for the genre as do I and probably hundreds - if not thousands - of others. Does Barbara Niven have a part in it?